Today was one of those days that remind me how much I love riding in the fall. In addition to the beautiful fall colors, the days are generally clear and crisp with bright sunshine. 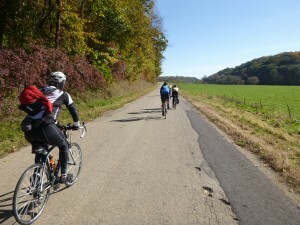 I scheduled this ride hoping to share my love of fall riding with others and wasn’t disappointed when ten riders showed up to share the day. The group was a mix of new and experienced randonneurs with four riders doing their first brevets and several Anciens including Robert Booth and Alex Piotrowski fresh off their successful rides at PBP. The “old timers” warned the new riders that they were on a slippery slope and they’d be sleeping on a picnic table at 2 AM in no time! 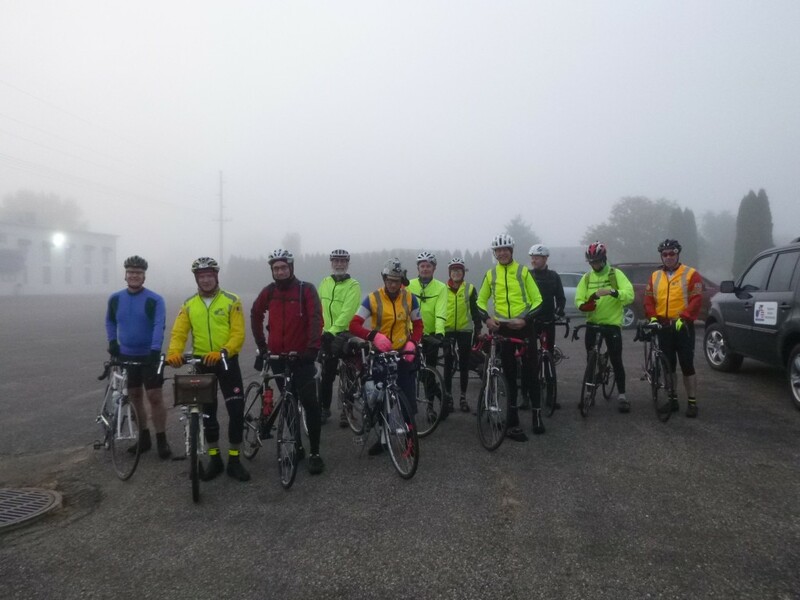 The temperature at the start was in the upper 30’s with fog – not uncommon this time of year. 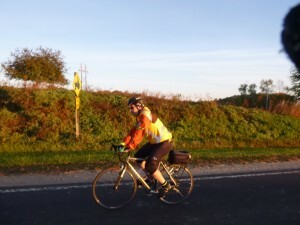 The route can best be described as a ride through river valleys with climbs over the ridge tops to link them together. 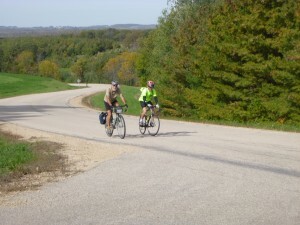 We’d ride through the Pine, Wisconsin, Green and Blue river valleys and do just under 4,000 feet of climbing. We got underway promptly at seven into a medium fog. 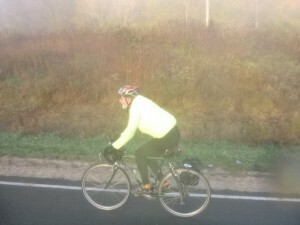 After a short ride through the “big city” we were quickly out of town and on quiet roads climbing above the fog. 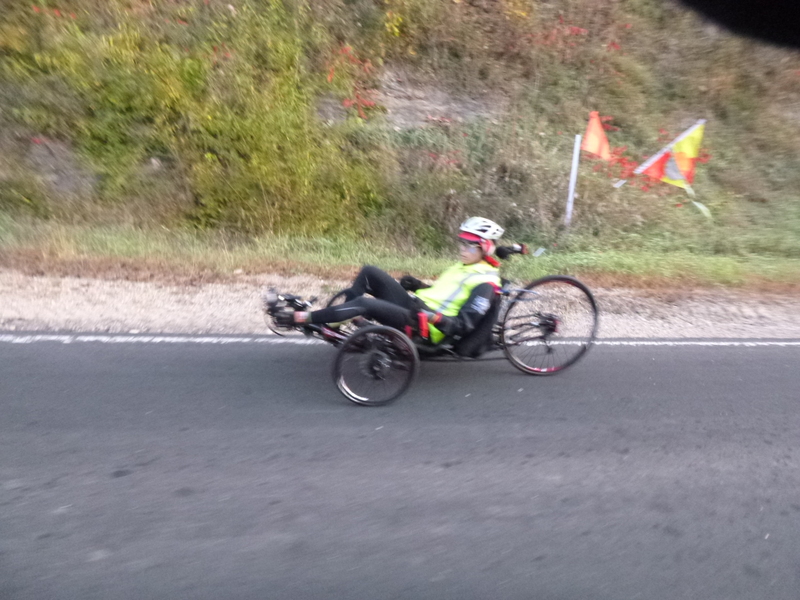 Here are Jeff and Susan on the first climb of the day. Jeff and Susan climbing above the fog. After descending we rode through newly harvested fields of corn and soybeans toward the first control in Boscobel (“wild turkey capital of the world”) where we made a brief stop to get cards signed and a quick snack before rolling on toward the town of Woodman (“last stop of the Dinky”) and through the Green River valley toward Fennimore. This is one of several of my favorite parts of this route, quiet roads with little to no traffic and glorious sunshine. The day was starting to warm up nicely and everyone was ready to shed some layers but we were enjoying the ride so much no one really wanted to stop. 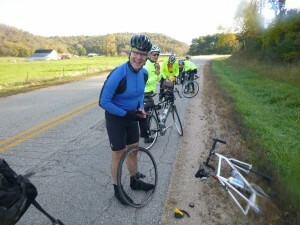 Rich “took one for the team” and had a flat so we could all strip while he fixed it – thanks Rich! Rich takes one for the team! Upon arriving at Fennimore it was time for a much needed (well, not that much needed but much appreciated!) break for some food at Timothy’s cafe. Lots of chatting back and forth about rides past and future plans. Leaving Fennimore we again entered one of my favorite parts of the ride through the Blue River valley and past Castle rock. I really like this stretch because it begins with a nice descent into the valley then several miles of flat roads before the climb up out of the valley – perfect for digesting the food we took on in Fennimore! An additional plus is the wind had come up out of the SW and the 50 miles or so to Spring Green was generally to the North and West so we had a very nice tailwind for that section. The climb out of the Blue River valley is a bit of a grind but everyone made it in good order. 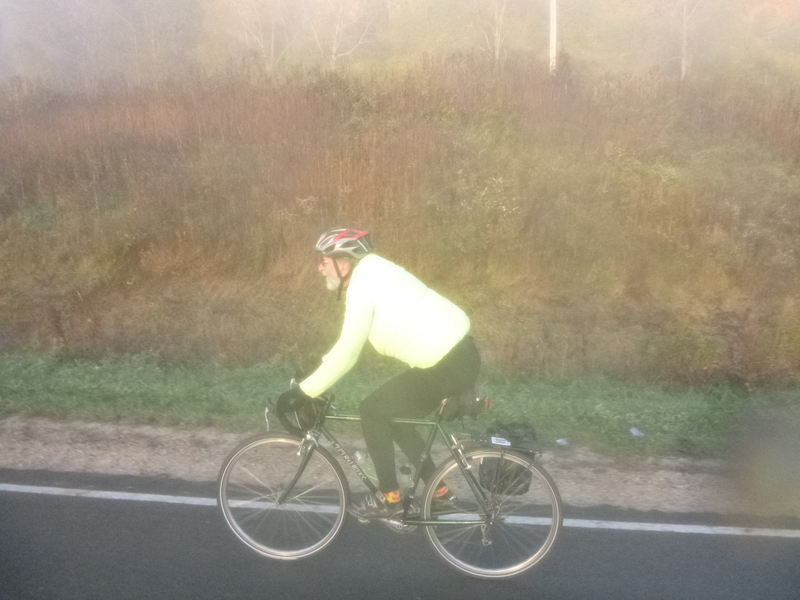 Then a short ride on the ridge top before a screaming descent followed by some rolling roads to our next control in Muscoda (pronounced “muss-co-day”). 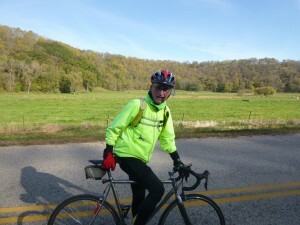 We all made a quick stop, eager to keep enjoying the tailwind to Spring Green. 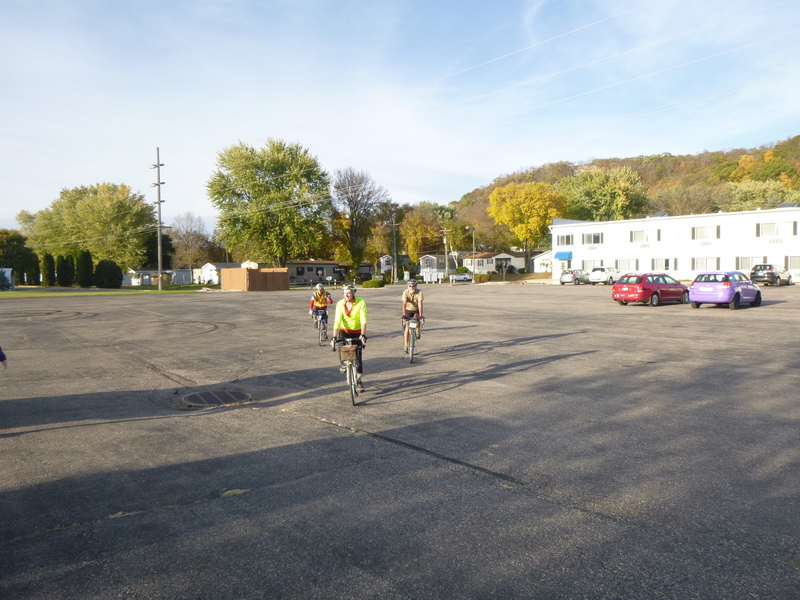 Rich left us at that point and turned toward Richland Center – family commitments prevented him from completing the ride. After Spring Green we had a bit of a grind into a quartering headwind to Gotham before turning North toward Richland Center and “the barn”. 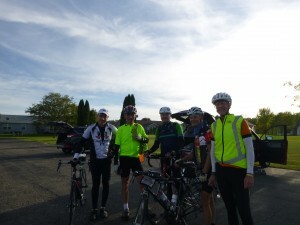 The ten remaining riders made it in well before dark with the last two arriving just before 6 PM. All in all, a beautiful day of fall riding!